From Vox, here are the Oscar nominations 2018: the complete list. As I've been writing all awards season, the top two speculative fiction movies of 2017 have been "The Shape of Water" and "Get Out." Yes, "Blade Runner 2049" may have one more nomination than "Get Out," but it isn't nominated for the most prestigious awards; "Get Out" is. Just the same, "Get Out" is very unlikely to win this category. Instead, it looks to be a contest between "The Shape of Water" and "Three Billboards Outside Ebbing, Missouri." I'm rooting for the romance with a fish-man, but I'm not optimistic, as most of the voters are actors and they awarded "Three Billboards" the equivalent of Best Picture at the SAG Awards. On another note, I think my readers and I should compare this list with the AFI top movies of 2017. Seven earned Oscar nominations while three missed the cut, "The Big Sick," "The Florida Project," and "Wonder Woman." The first two earned nominations in other categories, "The Big Sick" for Original Screenplay and "The Florida Project" for Willem Dafoe as Actor in a Supporting Role. "Wonder Woman" was the only AFI Movie of the Year to be completely shut out. I suspect that might prompt the Saturn Awards nominating committees to do their best to compensate for this oversight, including nominating Gal Gadot for Best Actress in a Film in addition to the expected nomination for Best Comic Book to Movie Adaptation. Guillermo Del Toro has won this award at all the awards shows that give out such an award so far, so I'm not expecting him to stumble now. I have the same thing to say about Gary Oldman that I did for Del Toro. He's won all the awards for leading actor that he is eligible for, so I don't expect him to lose now. Sorry, Daniel Kaluuya. This is Frances McDormand's role to lose, so I don't think Sally Hawkins has much of a chance. I'm sorry to see that Hong Chau didn't make the cut. That might be enough to convince the Saturn Awards nomination committee to include her in their awards. As for Octavia Spencer, she's a great actress but I think this one is going to Allison Janney. The Oscar will most likely go to Sam Rockwell. The next most likely is Willem Dafoe. I'm sympathetic to Christopher Plummer, the oldest nominee for an acting trophy, but I doubt he'll win. Richard Jenkins should just be happy to be nominated. Hey, look, "Logan," the first live-action superhero film to earn a screenwriting nomination at the Academy Awards. That's an honor that could have gone to "Deadpool" or "The Dark Knight" first. I'm happy for the writers, but I think this award will go to "Call Me by Your Name." "Coco" has this award in the bag. It had better hope the bag isn't wet. Thanks to File 770, I found out that "Body and Soul" is a speculative fiction film, so I added it to the total. I hope that's enough to get it nominated at the Saturn Awards, too. As for it winning here, I have my doubts. I suspect either "A Fantastic Woman" or "The Square" will get the Oscar. This is one category where I think "Blade Runner 2049" has a good chance of winning, followed by "The Shape of Water." As much as I'd like "The Shape of Water" to win this, I think this category is between "Baby Driver" and "I, Tonya" with "Baby Driver" favored. Oh, look, the first of two nominations for "Beauty and the Beast," the second highest grossing film of last year. It's joined by two other speculative fiction films, "Blade Runner 2049" and "The Shape of Water." Of the three, both the "The Shape of Water" and "Blade Runner 2049" have won awards for production design, although I would give more weight to the Critics' Choice Movie Award won by "The Shape of Water" than the six local critics groups who awarded "Blade Runner 2049" their honors in this category. Still, it won't matter until the Art Directors Guild Awards tomorrow. That's when I can actually begin to call this category. Now the second of two nominations for "Beauty and the Beast," which again competing with "The Shape of Water." Here, I think "Beauty and the Beast" has the advantage over its fantasy rival, as it has won several awards for Costume Design. That written, I think the favorite is "Phantom Thread," although I can't be definitive until the Costume Designers Guild announces its winners and even then, the two films are in separate categories. No speculative fiction films here, but I think that's because there are only three nominees. If there had been five, I'm sure "The Last Jedi" or "Beauty and the Beast" would have been nominated. In the long run, I don't think it will matter, as this is a contest between "Darkest Hour" and "Wonder" with the former favored. Now for the first of four nominations for "Star Wars: The Last Jedi." As much as John Williams is a sentimental favorite and perennial nominee and winner, I think this award will go to Alexandre Desplat for "The Shape of Water." Those two are the most listenable scores nominated. I also enjoyed the music for "Phantom Thread" but found both the music for "Dunkirk" and "Three Billboards" hard to listen to. That doesn't mean they don't belong; I think these are the right five choices from scripted movies. This isn't entirely the field I was hoping for, but it doesn't surprise, me, either. I've been a big fan of "Stand Up for Something" since it was nominated for a Grammy Award. "This is Me" won the Golden Globe and "Remember Me" earned a Critics' Choice Movie Award, where "Mystery of Love" was also nominated. As for "Mighty River," it earned a Golden Globe nomination along with Blige earning an acting nomination, which happened at the Oscars, too. * In Celebrating diversity in awards shows nominees and winners for MLK Day 2018, I wrote about its chances and what would happen should it be nominated. Blige not only wrote and performed the song, but also starred in the film. I would be pleasantly surprised if it were nominated for an Oscar, although doing so would likely push out either or both of "Truth to Power" from "An Inconvenient Sequel" and "Tell Me How Long" from "Chasing Coral." Well, I can't have everything. No, I can't. Speaking of which, I was right to be pessimistic about "I Don't Wanna Live Forever (Fifty Shades Darker)" in 'Transformers: The Last Knight' leads speculative fiction nominees at the 2018 Razzies. It didn't get a nomination. Oh, well, two out of three isn't bad. The same five movies, including three speculative fiction films and two action flicks, are nominated in both categories. 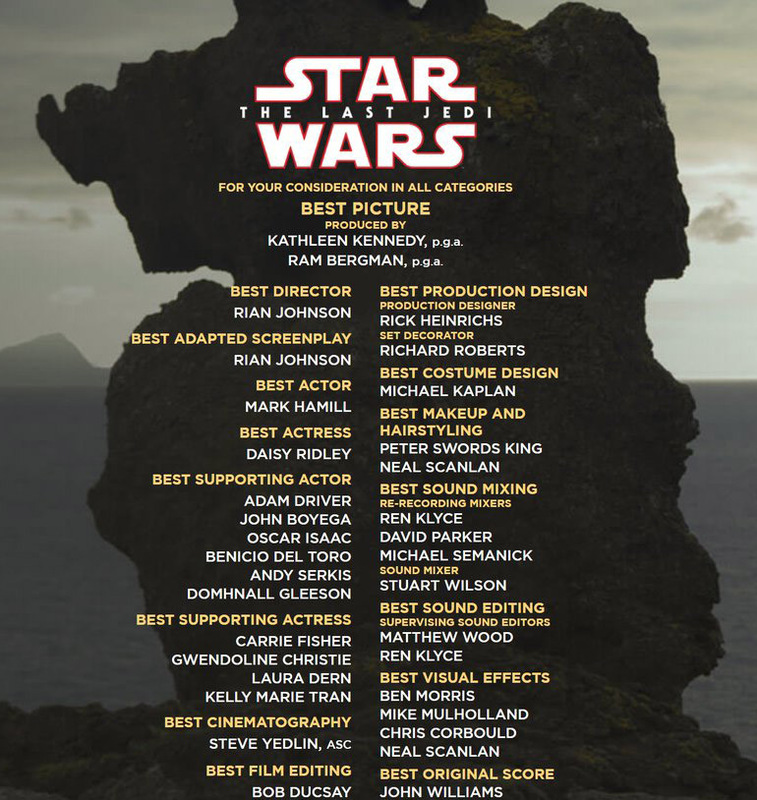 I'm rooting for "Star Wars: The Last Jedi," but any one of these nominees can win. All of the nominees are speculative fiction movies, including the only nominations for "Guardians of the Galaxy Vol. 2," "Kong: Skull Island," and "War for the Planet of the Apes" -- an ape vs. ape contest plus the only other nomination for a comic book movie. I'm rooting for "The Last Jedi" but think "War for the Planet of the Apes" is the favorite for its motion capture work. That written, this category is a guaranteed win for speculative fiction. I've already expressed my skepticism about "Basketball Dreams" or "Negative Space" being speculative fiction simply because they're animated, but otherwise this is a great category for fantasy. My pick is "Lou," which is a Pixar short. That's it for speculative fiction at the Academy Awards. I'll write entries about political films and documentaries later, most likely next month. In the meantime, stay tuned for a driving update and entries about the winners at the Art Directors Guild Awards and Grammy Awards. *Blige being nominated for both acting and music is a first at the Oscars. As I wrote in Midweek Cafe and Lounge, Vol. 49 at Booman Tribune, "This is the first time someone has been nominated at the Academy Awards for both music and acting in the same year. Not even Barbra Streisand has pulled that off!"